NASA has started a new mission to the red planet Mars. The major task of the Phoenix Mission is to look for signs of life, which means traces of water, on Mars. On board are two microscopes, an excavator shovel and seven Maxon Motor electro-motors. The anticipated landing of the Phoenix-Mars-Lander on Mars is scheduled in May 2008, after a nine month journey. The journey time and destination have been carefully thought through. For the first time, a probe will land on the northern hemisphere of the red planet at the beginning of its spring season. 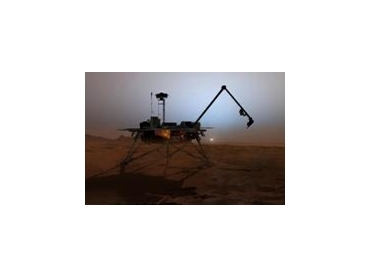 Since the first Mars landing in 1997, Maxon Motor has been a constant partner of NASA. The Pathfinder was fitted with 11 small Maxon motors. Both probes, Spirit and Opportunity, which landed on Mars in January 2005, had 39 Maxon motors which are still working. The recent project, Phoenix, is also supported by Maxon Motor. Not only will the probe search for visible water on the red planet, but will also dig for traces of water with a robot shovel. A robot arm, over 2 metres in length, will penetrate the thin layer of dust and rubble to lay bare the permanent ice on Mars. This is, at least, the hope of the researchers of the University in Neuenburg, who want to look at the soil samples with a special microscope, to assess if primitive life forms can be found beneath the surface of Mars. Also on board the Phoenix-Mars-Lander, are 7 RE 025 motors with special ball bearings. The motors were supplied by Maxon Motor in Sachseln. These motors are being used to position two solar cells that supply the probe with energy.